Liquid Church’s team did an incredible job hosting Camp Rock, a two-week arts and media camp held in two locations. I’m letting you in on some “small” stuff that made a big difference! 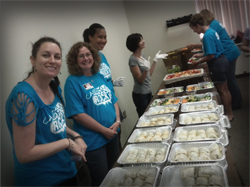 Take a look at this photo: Meg (far left) and some of her team are getting ready to serve lunch to our volunteers. It’s a small thing, right? Providing a meal for the team of people who make an event like this possible is a logical choice. But Meg did so much more than ordering some pizzas for the team. She crafted an incredibly welcoming environment for them! Variety // Every day for two weeks … something new! Great Presentation // For example, during the breakfast shift the cereal was presented in huge glass jars that made it look like candy! Smiling Faces // The team did more than “put out food.” They made sure people felt welcome and happy. They mixed, mingled and chatted up folks! Fund It // 12% of our Camp Rock budget went to this team. That’s more than we spent renting the facilities for two weeks! Think Volunteers // There is something magical about volunteers running an area that thanks volunteers. This team was 100% volunteer-led and staffed. The Velvet Rope // Years ago, I toured a church and they gave us access to every space in their facility (backstage, offices, all kids areas), except their volunteer lounge. Restricted access makes people with access feel more special. Don’t let just anybody in. What have you done that worked well for providing volunteer meals at your church or events? How can we improve this area? Let’s hear about your big small stuff this week! Leave a comment. Encouragement “spies”…people with the gift of encouragement who watch for great things that volunteers are doing and write a note of thanks saying that they were “caught” doing something really, really great as a volunteer. Senior staff of an organization taking time out to serve a meal to volunteers……breaks down any power differential. If you are in Canada…a “Timmies” run to give volunteers their favourite Tim Horton’s beverage. A thank you letter/email/fb message to the volunteer’s family for releasing them to serve. Thanks so much for your comments! You live that stuff out for sure! Thanks for your excellent leadership of volunteer teams over the years! Wage a war on chaos in your church communications! Big Small Stuff // Photos at Events!